At Tri-Cast we have complimented our proven Easy Reach Landing Net Handle range by developing a new 2 pce handle that is not only the ideal compact length, but is also extremely light and easy to use. 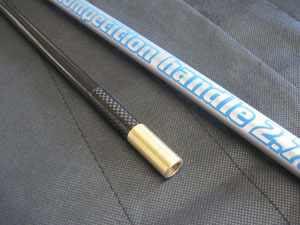 The Trilogy Landing Net Handle has all those attributes and more, plus an inbuilt strength in spite of its Ultra- Slim and Lightweight appearance. This is a 2pc 2.7 metres in length, Take Apart Handle. Supplied with a fully treated Brass Fitting at the tip, which means it will never rust. The fitting is an over fit, which is not only bonded into position using a special adhesive, but also for pure double protection is also Brass pinned. The handle is manufactured using Multi Modulus Carbon fibres to maximise the properties we consider are necessary with this type of product. It also ensures deceptive strength, Ultra-Light and Slim finished handle. The handle itself has a mere weight of less than 200grms.